Last week I wrote a post called Why Understanding Your Money Story Is The Key To Financial Freedom. This week I wanted to elaborate on some strategies that combined with the others I wrote about can have you seeing, feeling and acting differently about money. Because if you see your financial situation as a negative instead of a learning experience, it will be that much harder to achieve your get out of debt goals. So sit back and grab a cup of coffee, a pen, and piece of paper and let’s get started rewriting your story. Whether you like it or not, your childhood experiences determined how much money and success you feel you are capable of as an adult. Were you someone whose parents struggled with money and now you have a scarcity mindset when money is involved? Or were you given an endless supply of the things you wanted, including money? Whatever your situation was, you were learning from it the moment you were born. Our parents, relatives, and friends were your most consistent teacher. Subconsciously, you took on their actions and created your own money story. Luckily, you’re not your inherited habits. You’re a free-thinking human being, and you can take charge of your actions. You are the decider of your fate; if you want a life a filled with abundance, you can take meaningful steps towards that daily. Your beliefs are the core of who you are. Whatever you believe in your mind is what’s forming the results in your life. That is why you keep getting the same results in your life over and over again. You will attract events, circumstances, experiences, and people into your life that are in alignment with your beliefs. If you’re not experiencing financial abundance and prosperity, if you’re struggling with debt and don’t feel your paid your worth, then I invite you to examine the beliefs you hold about money and wealth. Are you willing to give up old, worn out ideas that do NOT serve you in order to live an abundant, prosperous life? 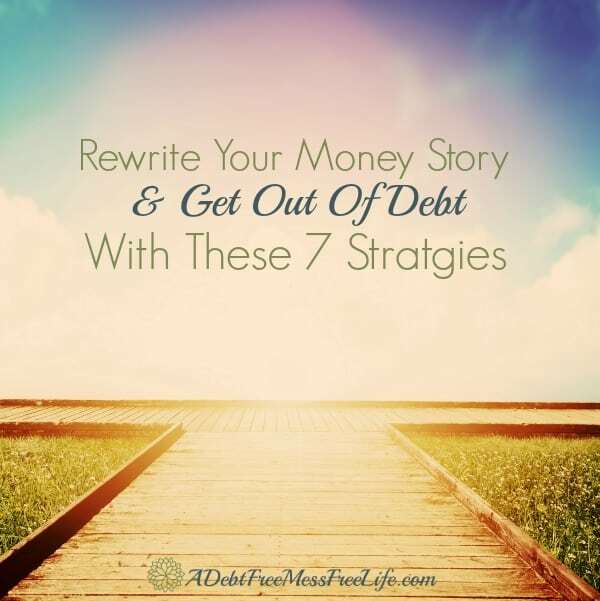 If you’re willing to give up old, worn out beliefs that do not serve you in order to get out of debt and experience financial freedom, you’ll find as you work diligently to rewrite your story and discard what no longer works that you’re moving closer and closer to your desired money story. The stories you tell yourself about money will keep you stuck. It’s time to stop telling them and create a new story. If you’re struggling to get out of debt, you can now look at debt as an important lesson learned about money. You can see yourself, not as someone with debt, but someone who is successfully paying it off. Can you feel the difference? Remember your old story is just a story and you can change it. Because you probably struggle with the notion of what it would be like to have a substantial amount of money, one of the ways you can affect your thinking is to see money as a tool to help not only yourself but others. Start looking at how you can be of service to others when you have money in the bank. If you had two million dollars in the bank, how would your life be different? Which charities could you support? What could you do to help your family and friends? You become like the top 5 people you associate with the most. Let go of people who complain about how miserable their lives are. Instead, surround yourself with individuals who feel positive about money or who are also diligently working on making their financial situation better. Create a money goal and then develop the success strategy needed to reach that goal. In this way, your vision and your strategy influence your action steps—and it’s your direct action steps towards your financial reality which determines what you will achieve. It’s not too late to set some money goals for yourself for 2016, so if you haven’t already, why not make a promise to yourself that this time next year you’ll be in better shape financially than you are now? Write down your goals for the next 12 months. Make your goals clear, measurable, and time-specific so you can track your success. Tape the list to your mirror, on your refrigerator, or on your bedroom wall, where you can read them and focus on them every day. We really do attract the things on which we focus, so keep your focus on what you want in your life! “Thoughts become things”. Your mindset does create your reality. It controls and influences your actions, choices, and behaviors—all of which are important when pursuing and achieving any goal. This is why if you want to experience greater levels of financial independence you need to think differently—especially as your current thinking has created your current life experience. Toss aside all the old notions you might have about being undeserving of money and undeserving of being debt free. Open up to the likelihood that if you start to rewrite your money story, you can achieve exactly what you want: a life free of debt, with some money in the bank, earning the salary you desire.